Paper Pearl: Welcome to Back to School Week! The last breath of summer is being taken. I know my cousins start back to school this week, but all around Nashville kids are back into the swing of things. We are deeming this "Back to School Week" here on Paper Pearl, but that doesn't mean this is for kids. If you're a mom, a college student, a high schooler, or just someone that passes a school on your way to work (that's me!) this is still relevant to you. Most likely if you fall into the same category with me, you at least know someone that is headed back to school. There is still always a little bit of excitement in the air when school starts back. I felt the need to buy new office supplies this past weekend. It is catching. Alison and I will bring you some back to school fashion, healthy after-school or mid-afternoon snacks, tips on how to capture the best photo with friends or those playing sports and some cool office and school supplies that you may still need or want! A CUSTOM SIGN for your classroom in a regular 8.5x11 as well as an 11x17. This is great for a cute frame, to be laminated or for small spaces on your door. WELCOME SIGN that coordinates with your custom sign, also in two sizes: 8.5x11 and 11x17. NAME PLATES for your desks with your children's names in them. You can choose to have the child's first name or first and last on the name plate. 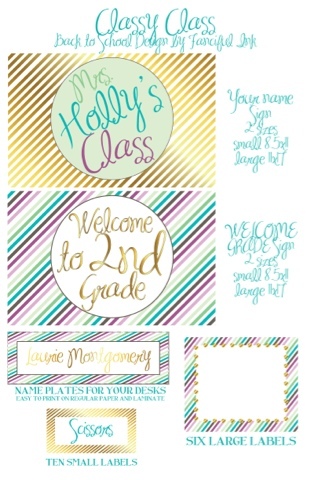 Your entire class is included in this set, simply provide your list of names. TEN SMALL LABELS that are perfect for small supplies, however you like to store them. You may choose the ten supplies to be listed on the labels in the font that is used in the particular package you choose, or you can choose to leave them blank and write in your supplies as you see fit. For the digital file package, the proper label information to be printed on will be provided. The design will be laid out for an easy print by you. SIX LARGE LABELS you can use to organize your classroom. You provide the list of the six supplies you would like on the labels, or you may leave them blank. For the digital file package, the proper label information to be printed on will be provided. The design will be laid out for an easy print by you. 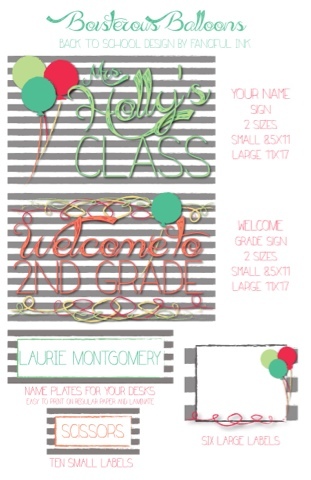 Choose from one of the three different design sets for $50, which includes personalization of your name, grade, children's names for the nameplates, up to ten "small label" supplies (or you can leave these blank to write in), up to six "large label" supplies (this can also be blank for you to write in). This is a digital PDF file, allowing you to print at home, in your classroom, or at your local printer and even use it for years to come. Directions will be included for printing. 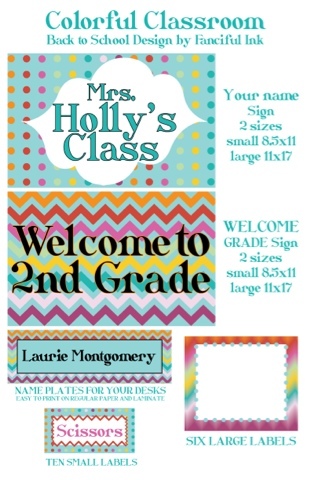 Colors, fonts and set design cannot be changed, only your personal information that is specific to your classroom. For $60, Fanciful Ink will print the pieces for you and mail them to you. Or if you want your own custom design for the exact same amount of pieces, you can have a custom design for $75 in digital form; $85 printed by Fanciful Ink.